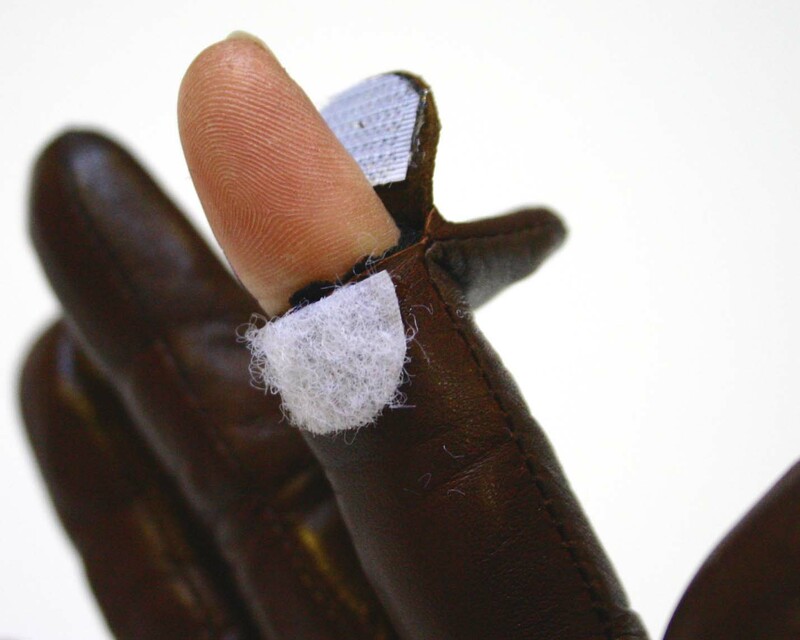 An "iPhoned" glove frees up a single fingertip for answering calls in the cold! 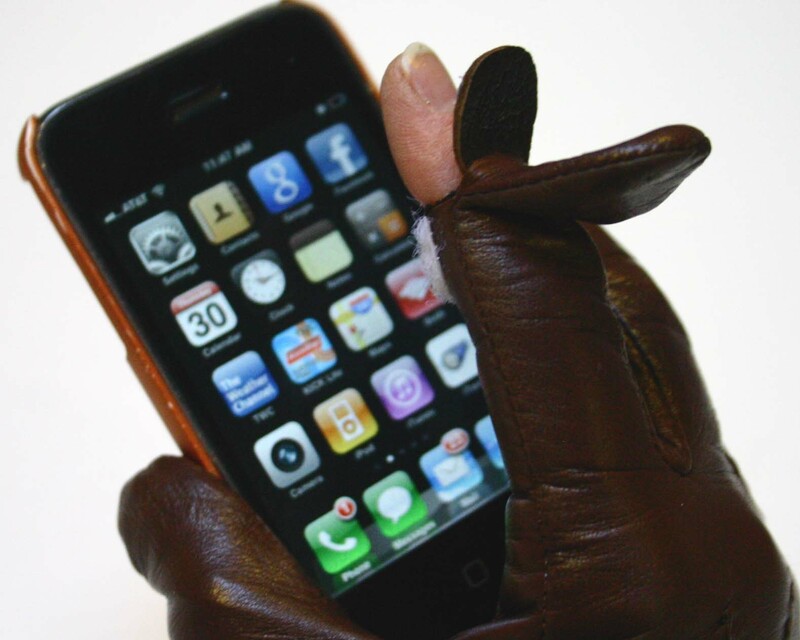 You might not mind having to take your glove off every time you get a call on your smart phone, but it drives me CRAZY…especially since I decided to sport the long-leather-glove-with-a-3/4-sleeve look. So, I decided to officially “iPhone” my right glove to free up a fingertip for touch screen action. For this project, you will need leather gloves, a piece of thin scrap leather close to the color of your gloves, Velcro, scissors and E6000 glue. I used white Velcro so it would show up better in photos, but I recommend using whatever color is closest to your glove. 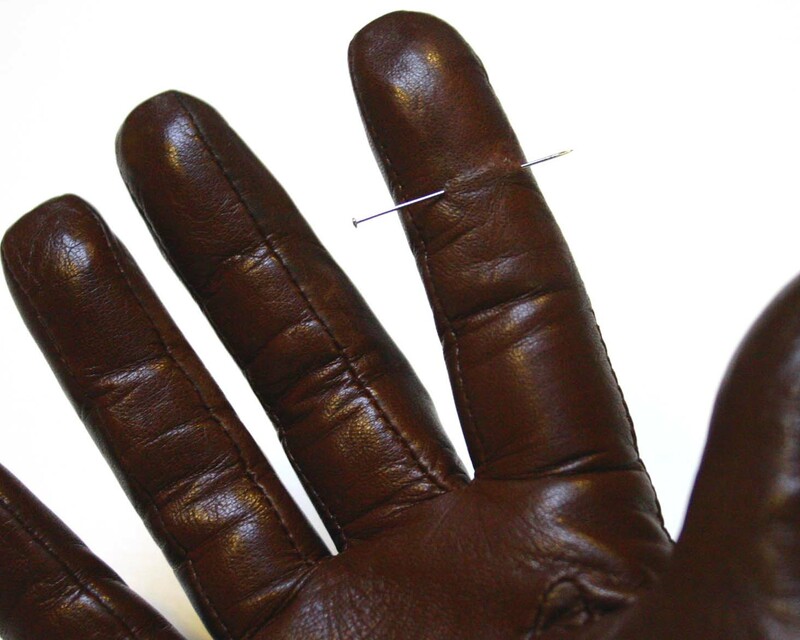 Put on your glove and pin at the bottom of the first joint on your primary iPhone finger. Take off the glove, and carefully cut through one layer of leather and only one layer of lining on the palm side of the glove. 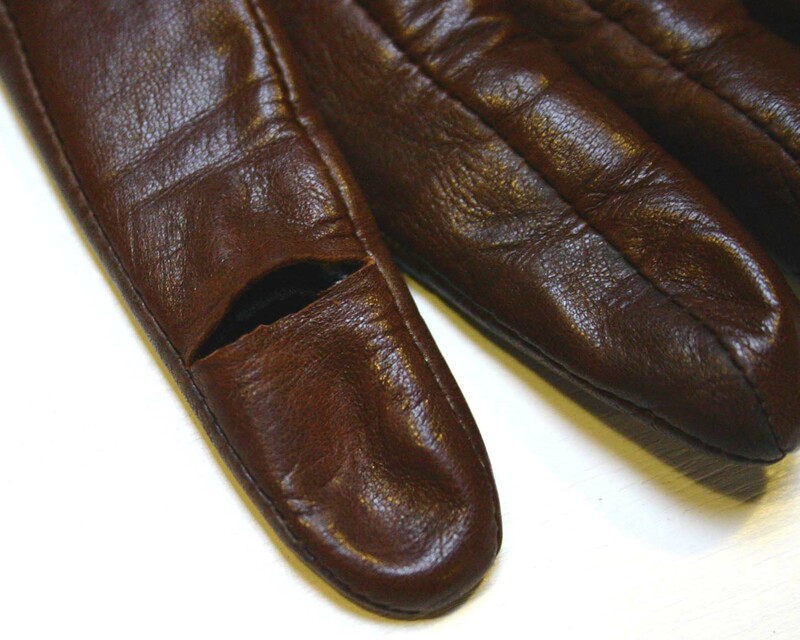 Be sure you don't cut through the seams- you don't want your glove to fall apart! 1. Cut a piece of leather the same width of the finger and about 1 inch long. Round the edges. 2. On the sueded side of the leather, apply glue to ONE tip of the leather and apply the male side of the Velcro. 3. 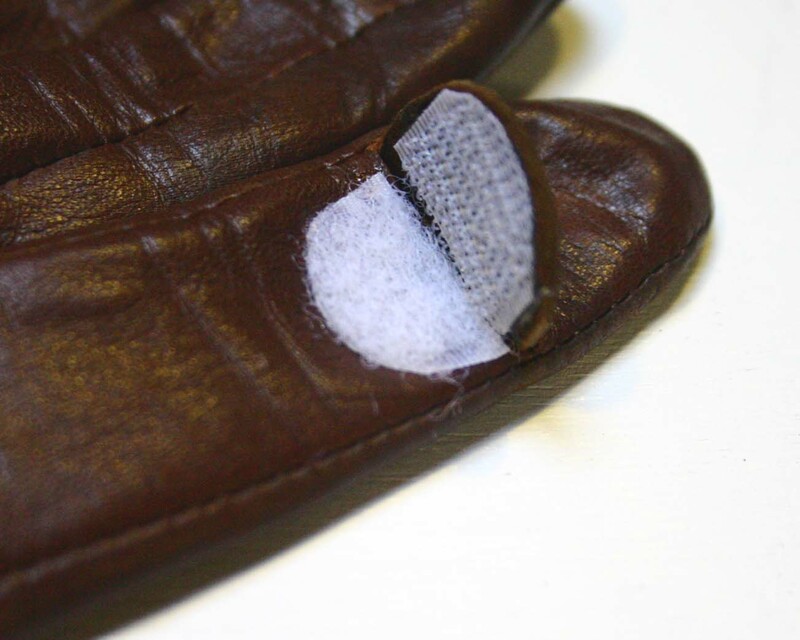 Once that dries, trim off the excess velcro, cut the same shape from the female side of the velcro and glue it onto the glove just below the cut line. Allow to dry completely. 4. 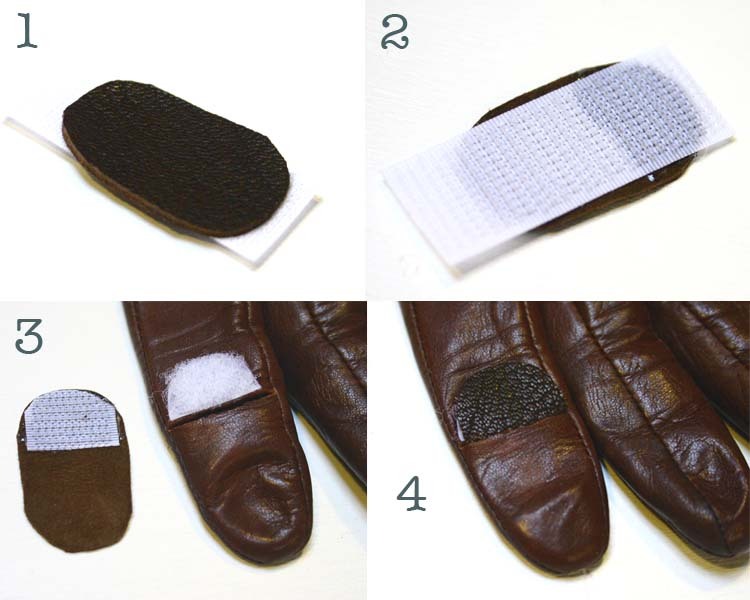 Flip the leather piece over, apply glue to the tip without velcro, carefully slip into the slit on the glove, press gently and allow to dry. Once dry, this is how your finger should look! When you want to use your fingertip, just unvelcro and poke your finger out! HA HA HA!!!! I can just imagine the looks I’d get pulling a sausage out of my pocket every time my phone rings!